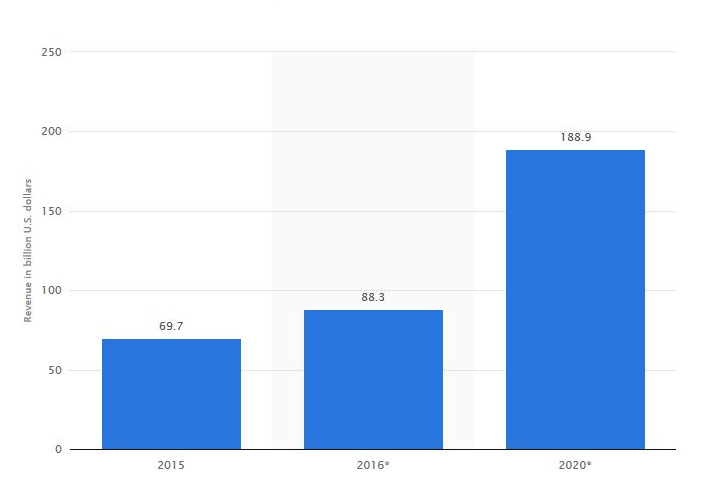 With almost $90 billions of worldwide app revenue in 2016 and predicted 214% growth till 2020, mobile applications are definitely a very profitable business. After all, according to Smart Insights’ report, 78% of people own a smartphone in 2016 and they spend 90% of their mobile time using apps. That’s still enough market space to take. And it’s a great opportunity for all app entrepreneurs, being it a retailer or an organization in need for a supportive application or a startup focused mainly on its apps’ innovative function. Why is not everybody building their own mobile app then? The common answers include big mobile app development costs. But wait a minute! Are you really need one million U.S. dollars to develop a successful app? Not really. So how much does it really cost to develop a mobile app and what does it depend on? Check our guide. Mobile application development is a complex process and it requires a lot of technical knowledge and experience. It’s not only a programmer who is needed – there are also other members in an app development team (e.g. graphic designers, project managers, testers etc.) who have highly specific knowledge and skills unique on the labor market. That’s why you need to be prepared for much more than $1,000 to make an app that really offers something valuable to users. It is just this simple: you pay for man-hours spent on creating your app and this time cannot be lower if you want a fully-developed product. And how much do you pay for a man-hour in a software house? The prices differ greatly from one country to another – from more than $200 per hour in the U.S. or Canada to less than $15 per hour in some Asian countries. So how big should your general budget be? Simple applications for one platform will start around at least $15,000 and the upper limit is indefinite and depends on how complex your app will be. It can reach even more than $1,000,000 but on average it shouldn’t exceed $500,000. The range is huge – that’s true. But how much will YOUR app cost? At Ready4S we believe that a good app can be done from around $30,000. But of course – the project management triangle is applicable in the mobile app development, too. This means, creating an app is always a compromise between three factors: quality, pace and price. And if you decide to reduce price, you should be aware that the quality can be lower or the process will take more time. 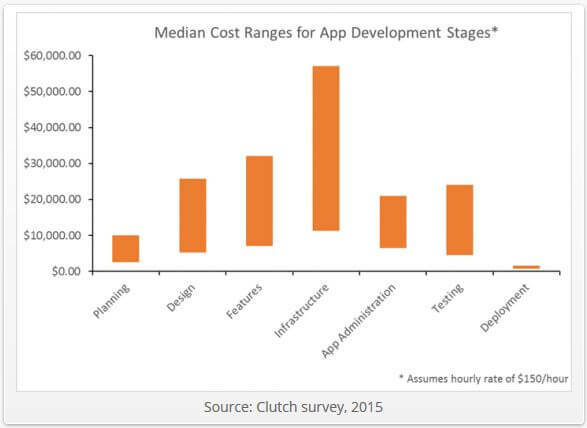 What do app development costs depend on? Your app price depends on what kind of app you want. Below you can find some important factors. As the overall cost of your app is based on the number of man-hours, it is not surprising that the more complex your application’s architecture is, the more it costs. A simple app with a basic table functionality is the cheapest option. You don’t need a lot of backend to build it, it doesn’t have a lot of functionalities and thus it can be a good choice for beginners in the mobile industry. Such applications may not become a second Facebook, but they can be useful for their users and bring their owners significant profit. More complex applications are those which need a database, CMS, advanced admin options, social features or external API integration. Such features require an advanced software architecture and thus take more time and highly-qualified labor to create. There are also other applications such as advanced games or apps using 3D, Virtual Reality, Augmented Reality, Internet of Things or other custom utilities. Their prices differ greatly and the best way to find out how much such apps cost is to ask an experienced developer for an estimation. App functionalities are specific features that the application has. Each of them takes a different amount of time to develop, depending on how difficult and complex they are, so it is impossible to tell exactly how much a functionality will cost in your specific case. An average price for one feature can range from a couple hundred to a couple thousand U.S. dollars. Development costs depend on a number of platforms on which your app will be available, too. As an app cannot be just “copied” for a different platform and coding for Android, iOS and Windows Phone requires different SDKs and programming languages, it is obvious that the price rises with the number of platforms. However, it is not a simple multiplying one app costs x2 or x3. App development process consists of many phases – from planning, through design, coding to testing. Although it is not advisable to skip any of them if you want a fully functioning app, you might be curious which one takes the most of your time and money. A diagram below shows how much each phase costs, according to Clutch survey. The survey assumed an hourly rate of $150/hour – but it can be adequate for any other hourly rate and the costs will be proportionately lower. There are many pros and cons of working with either a software house or freelancer. And the main factors to consider are your safety, reliability, quality and app price. Considering the price factor – it’s true – freelancers are cheaper. But how can you be sure that the code is of high quality? Are you the right person to judge a developer by their portfolio? There’s always a risk when it comes to the quality of service you get from freelancers. They can spoil your work and stop the project for ages and it is extremely difficult to make them take the responsibility for what they’ve done. Software house, on the other hand, has a certain reputation to keep and just cannot afford letting you down. They also hire a team of experts from different fields – from iOS and Android developers to backend programmers, graphic designers, and testers – and the cooperation of such a team results in much better effects than hiring a one-man band. The cost of an app depends not only on the quality of services but also on a part of the world which a software house is from. The man-hours price range is huge – in some developed countries like the U.S. $200 per hour is a standard, while on Asian market you can hire an app developer for 10 or even 20 times less. But the prices do not always reflect the real quality of software produced in these countries. 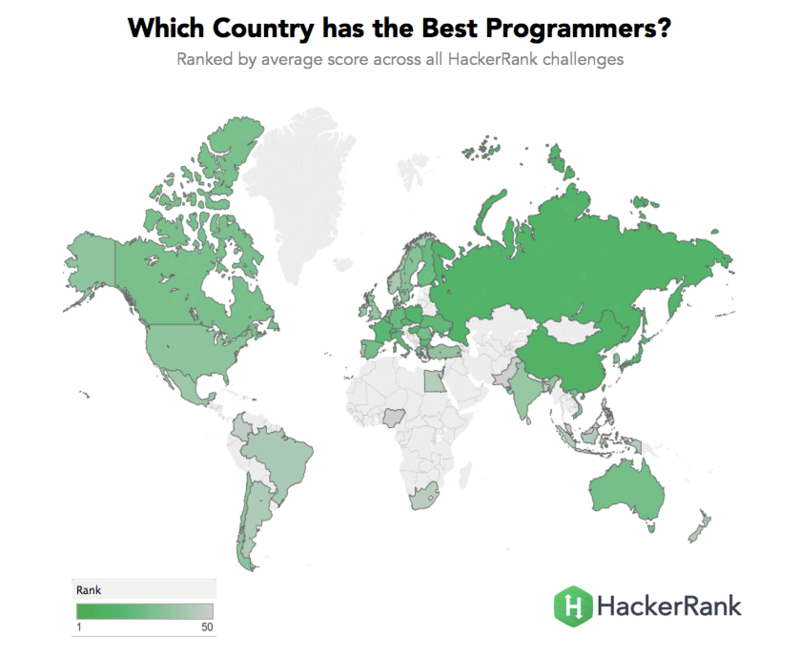 For example on the map below, created by HackerRank, you can see countries with the best app developers in the world: the darker green, the higher position. The podium was taken by Russian, Polish and Chinese developers. However, prices of development in these countries are more competitive than in the U.S., Western Europe or Australia which don’t score so well in the competition. If there is one thing worth giving an advice on app development prices, it is: know the market and be prepared for numbers such as tens thousand dollars. Of course, there probably exist “developers” claiming they will do your app for a hundred bucks (maybe programmers from high school?) but do you really want to risk loosing your whole budget for an app that doesn’t work or is not finished at all? WHY 87% OF MILLENIALS NEVER SEPARATE FROM THEIR MOBILE DEVICES?